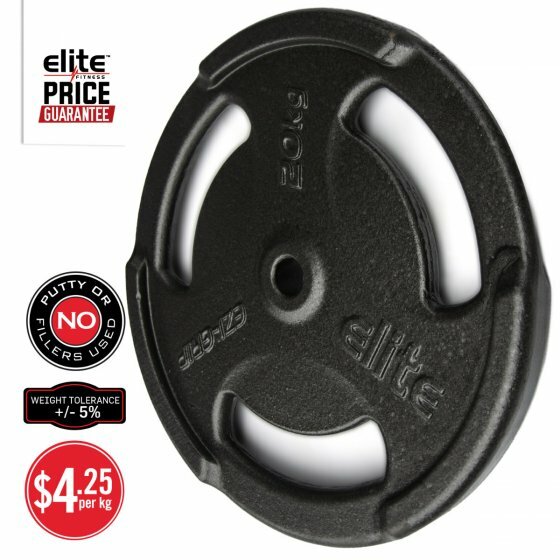 The unique Elite EZI-GRIP plate has been carefully designed to ensure a comfortable stronger grip when using the plates, allowing them to be totally versatile so you get the most out of your workouts. The EZI-GRIP plate can be used for all types of functional training, you can achieve a full body workout with just a few plates! The plates are made of solid cast iron and can be used on all standard diameter bars or handles. No Putty or Fillers Used: Our weight plate manufacturers do not use putty or fillers in our weight plates. Some lower priced/budget grip/whole plates use putty and fillers to hide the manufacturing defects. it is very common in the process of sand casting that air bubbles form in the smaller parts of the mould especially around the handle of the weight plate. Putty and fillers are used to fill these holes and the weight plate is then painted and you the consumer never know. We guarantee this never happens with our weight plates.